The Tecnifibre ATP Razor Code tennis string set offers a monofilament construction and is used by the ATP World Tour Players. It features high modulus polyester for excellent durability and is textured for more spin. Additionally, it is 12m (39.4ft) long which makes it enough to re-string one racket. 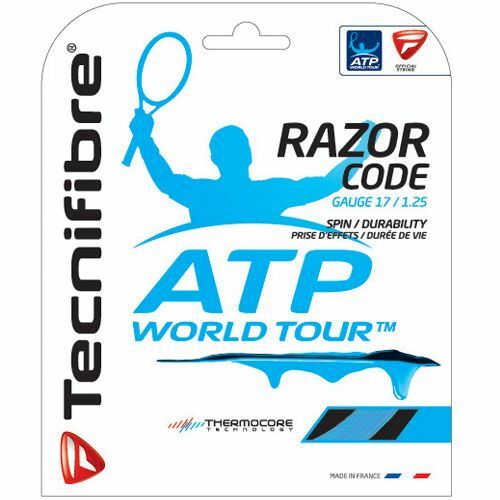 for submitting product information about Tecnifibre ATP Razor Code Tennis String Set We aim to answer all questions within 2-3 days. for submitting product information about Tecnifibre ATP Razor Code Tennis String Set. We aim to answer all questions within 2-3 days. If you provided your name and email address, we will email you as soon as the answer is published. for submitting product review about Tecnifibre ATP Razor Code Tennis String Set.